This is my tribute to one of the greatest anime characters of all time. 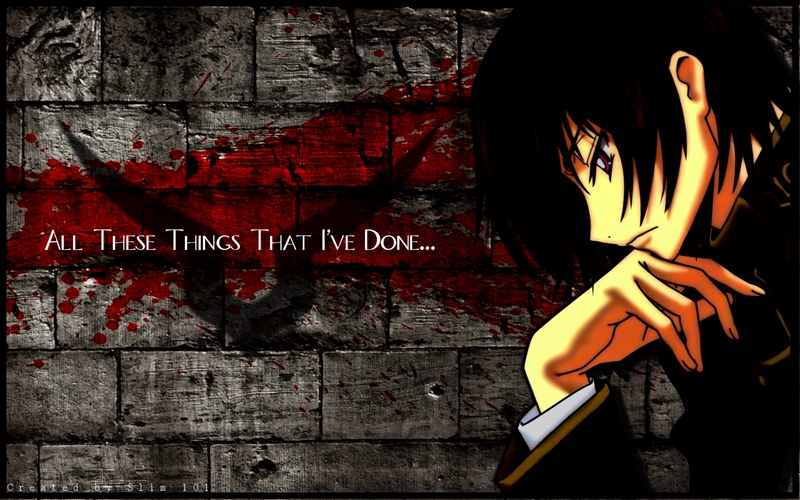 The ending of Code Geass was so moving I felt compelled to make a Lelouch wallpaper. I got the scan from AnimePaper and the brick wall and splatter textures from www.cgtextures.com. I happened to be listening to "All These Things That I've Done" by the Killers when I started this wall and thought the words fit Lelouch's expression. I probably spent five hours total on it. OK people please explain to me what is that good about your favorite character ever to die and to be killed by Suzaku(my love)? So I think I messed up when uploading, because that's the wrong category. How do I change that? the mods will probably change the category for you as soon as they see it. i think the brick needs to be blurred a little bit more and/or lelouch needs some texture to make the wall fit better. Yes, it's really "rainy" picture. Thank you, dear, for sharing! Reminds me of a Linkin Park song ^_^ Great wallpaper!